Your nightly snoring has become a major sleep disturbance for you and other family members. But it may be more than an irritation — it could also be a sign of sleep apnea, a condition that increases your risk for life-threatening illnesses like high blood pressure or heart disease. Sleep apnea most often occurs when the tongue or other soft tissues block the airway during sleep. The resulting lack of oxygen triggers the brain to wake the body to readjust the airway. This waking may only last a few seconds, but it can occur several times a night. Besides its long-term health effects, this constant waking through the night can result in irritability, drowsiness and brain fog during the day. One of the best ways to treat sleep apnea is continuous positive airway pressure (CPAP) therapy. This requires an electric pump that supplies constant pressurized air to a face mask worn during sleep to keep the airway open. But although effective, many patients find a CPAP machine clumsy and uncomfortable to wear. That's why you may want to consider an option from your family dentist called oral appliance therapy (OAT). An OAT device is a custom-made appliance that fits in the mouth like a sports mouthguard or orthodontic retainer. The majority of OAT appliances use tiny metal hinges to move the lower jaw and tongue forward to make the airway larger, thus improving air flow. Another version works by holding the tongue away from the back of the throat, either by holding the tongue forward like a tongue depressor or with a small compartment fitted around the tongue that holds it back with suction. Before considering an OAT appliance, your dentist may refer you to a sleep specialist to confirm you have sleep apnea through laboratory or home testing. If you do and you meet other criteria, you could benefit from an OAT appliance. There may be other factors to consider, though, so be sure to discuss your options with your dentist or physician to find the right solution for a better night's sleep. Daily fatigue or complaints of your snoring from family have led you to see your doctor about the problem. After an exam and a test session in a sleep lab, your problem now has a name — obstructive sleep apnea. This common sleep-related breathing disorder (SRBD) occurs when the soft tissues in the back of the throat over-relax during sleep. The relaxed tissues obstruct air flow to the trachea (windpipe) and cause “apnea,” where you cease to breathe. The lack of oxygen causes you to wake, even for a micro-second, to begin breathing again. This may occur multiple times throughout the night, diminishing the quality of your sleep and leading not only to drowsiness and daily fatigue but also contribute to cardiovascular disease or other systemic conditions. The most effective treatment for sleep apnea is the use of a Continuous Positive Airway Pressure (CPAP) machine while you sleep. The machine delivers pressurized air to a face mask you wear while you sleep; the additional pressure keeps the airway open. However, a CPAP machine does have a few disadvantages, including discomfort while attached to the machine, nasal congestion and dryness, or claustrophobia. These effects can be so pronounced for some patients, they’re unable to adjust themselves to the machine. If you have mild to moderate sleep apnea, there may be an alternative — a custom-fitted oral appliance we manufacture for you to wear in your mouth while you sleep. The appliance pulls the lower jaw forward resulting in a wider opening of the airway. In addition to being less cumbersome than a CPAP mask, an oral appliance is easier to wear, compact in size for easy travel and doesn’t require electricity. While an oral appliance is an effective alternative to a CPAP machine for many patients, it does have a few disadvantages including problems with saliva flow (too much or too little), muscle or teeth soreness and minor tooth or jaw movement. 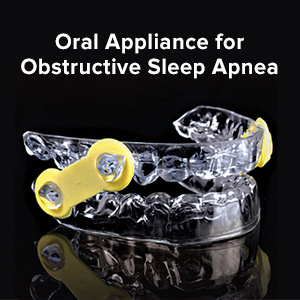 Still, an oral appliance might be the right solution to relieve your sleep apnea over the long-term.